The road has become increasingly dangerous for drivers since the advent of cell phone technology and applications such as text messaging, SnapChat and the like. While your company may have drivers on the road completing tasks throughout the day, you may not have policies in place to limit cell phone use behind the wheel and distracted drivers. Whether you have a distracted driver policy in place or not, there is a chance your employees could be using their cell phones to communicate with you while on the move. Almost all provinces and territories in Canada have restrictions for use of mobile phones while driving – some of which include fines and demerit points if caught. This is where two way radios come in because of their ability to not be a liability for your company when your employees are using them as a communication tool on the road. Operating a two way radio on the road often requires less distraction from your employee, including less need for reaching and, of course, less need to work buttons and screens that often come with navigating a cell phone. Mobile Radios (instead of portable) – These radios, when installed properly, are great tools for busy, on-the-road, employees. A great communication tool, they are just mounted to the vehicle versus the handheld portable two way radio option. Headsets – A safe, effective tool for listening and ensuring the message relayed is heard correctly the first time. Options include Bluetooth headsets, which are top sellers here at Nova. Speaker mics – Drivers may feel better knowing their communication tool is attached to their lapel while their driving, which means at the press of a button, they can transmit and receive voice messages with their team, while never having to look down. It also ensures the two way radio is not being held while driving. Vehicle mounts for portable two way radios – If this is placed near the wheel for portable radios, it provides easy access to the radio while not distracting from the road. That’s not to say that, even if these tools are in place, there are not safer ways to use your two way radio. The key is to not take your eyes off the road when communication is necessary, so ensuring that is the case is best for your employees and prevents distracted driving. The added bonus? 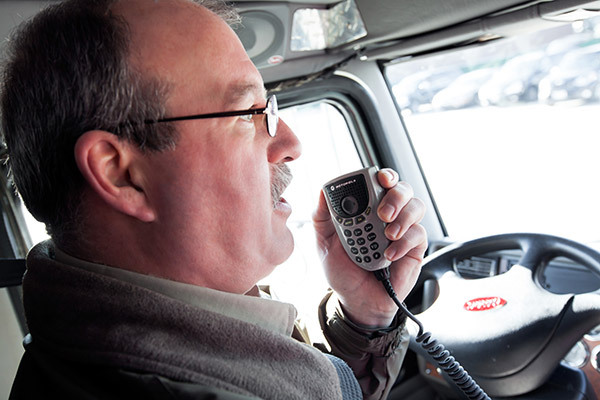 Depending on the radio technology and system you invest in, a number of digital two way radios have the capability of text messaging features for when your driver is safely pulled over, GPS tracking technology and added features such as work order tools. Nova Communications is Canada’s number one online Motorola two way radio and accessory dealer, so you know we can offer the best of the best in terms of products, and the knowledge it takes to find what would work best for your team. All in all, the two way radio is a great communication tool for your team, and ensures your employee – whether they’re driving in the city or long haul, are doing so safely. Want to learn more about the advantages of two way radio systems for your business? Contact our sales team today! Hi, this is a great article highlighting the challenges faced by users on the go… Additional solutions that will further enhance performance, convenience and safety is the Long Range Wireless RSM by Motorola for MOTOTRBO mobile radios. You can stay connected while out of the vehicle and respond to calls with out returning to the vehicle. Thank you, Richard. That’s great feedback!